One way to blend fiber is directly after washing and drying, before the fiber is carded. This is a good option for fibers that need to be completely blended together (for example, different types of fiber such as alpaca and sheep's wool). 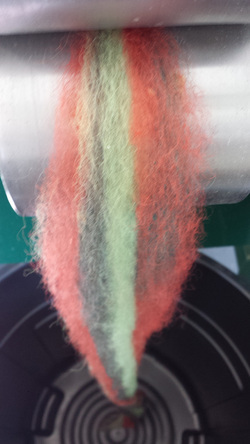 Another option is to blend fibers during the carding process This can provide some subtle variation in color. Pindrafting is one of the best times to blend different colors of fiber. A variety of different patterns can be created by blending colors at this point in processing. Pindrafting is also the best stage if you want fibers such as nylon or silk added to your fiber.